THE TERMS AND CONDITIONS SET FORTH BELOW (THE “TERMS”) GOVERN YOUR USE OF THE T. E. A. L. WEB SITE AND THE SERVICES AVAILABLE ON THIS WEB SITE. 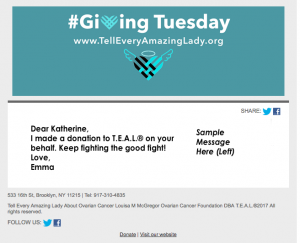 THESE TERMS ARE A LEGAL CONTRACT BETWEEN YOU AND TELL EVERY AMAZING LADY ABOUT OVARIAN CANCER LOUISA M. MCGREGOR OVARIAN CANCER FOUNDATION (“T. E. A. L.”, “WE”, “US”, OR “TEALWALK”) AND GOVERN YOUR ACCESS TO AND USE OF THE T. E. A. L. WEB SITES LOCATED AT: www.tealwalk.org and www.telleveryamazinglady.org (THE “SITE”). YOUR USE OF T. E. A. L.’S SITE AND THE RELATED SERVICES ARE SUBJECT TO THESE TERMS. BY USING THE SITE OR THE SERVICES PROVIDED THEREON, MAKING A DONATION USING THE SITE, OR PURCHASING PRODUCTS AND SERVICES BY USING THE SITE, YOU AGREE TO BE BOUND BY THESE TERMS. IF YOU DO NOT AGREE TO ALL OF THESE TERMS, DO NOT USE THE SITE AND/OR THE SERVICES. IF YOU ARE NOT AT LEAST (18) YEARS OLD YOU MAY NOT USE THIS SITE. YOU AGREE THAT USE OF THE SERVICES AND/OR USE OF THE SITE SIGNIFIES THAT YOU HAVE READ, UNDERSTOOD, AND AGREE TO BE BOUND BY THESE TERMS. T. E. A. L. MAY MAKE CHANGES TO THE SITE AND/OR SERVICES OFFERED ON THE SITE, T. E. A. L. CAN CHANGE THESE TERMS AT ANY TIME IN T. E. A. L.’S SOLE AND ABSOLUTE DISCRETION, AND T. E. A. L. WILL POST NOTICE OF THE CHANGES AND THE UPDATED TERMS ON THE SITE. SUCH CHANGES WILL BE EFFECTIVE IMMEDIATELY UPON POSTING UNLESS OTHERWISE STATED. YOUR CONTINUED USE OF THE SITE AFTER SUCH CHANGES HAVE BEEN POSTED MEANS THAT YOU AGREE TO THE NEW TERMS, EVEN IF YOU HAVE NOT REVIEWED THE CHANGES. THEREFORE, YOU SHOULD CHECK THE TERMS POSTED ON THE SITE PERIODICALLY FOR UPDATES AND CHANGES. OUR FAILURE TO ENFORCE THESE TERMS, FOR WHATEVER REASON, WILL NOT BE CONSTRUED AS A WAIVER OF OUR RIGHT TO DO SO AT ANY TIME. WE MAY SUSPEND OR TERMINATE YOUR ACCESS TO THIS SITE IF WE BELIEVE A BREACH OF THESE TERMS HAS OCCURRED FOR WHICH YOU ARE RESPONSIBLE. This Site is the appropriate website to discuss and make comments and suggestions for T. E. A. L. products and services but not to discuss and make comments and suggestions about Drupal technology in general. Therefore, please do not post any comments and suggestions about Drupal technology in general to this Site. T. E. A. L. has the right to use any information, comments, ideas and/or suggestions that you post to any area of the Site or include in any e-mail to T. E. A. L. for any purpose and on an unrestricted basis, so if you are concerned about protecting your intellectual property rights that may be embodied in any of the forgoing, do not post them on any area of the Site or include them in any e-mail you send to T. E. A. L.. Please also see the Postings and Submissions section below. Certain information, documents, products and services provided on and through the Site, including content, trademarks, logos, graphics and images that are not Submissions or Postings (both as defined below) (together, the “Materials”) are provided to you by T. E. A. L. and are the copyrighted work of T. E. A. L. or T. E. A. L.’s contributors. In addition, T. E. A. L. may make software products available to you on the Site for download (the “Software”) and related services thereto (the “Services”). Your use of the Software is governed by the terms of the GNU General Public License, Version 2, the terms of which can be accessed here: http://www.gnu.org/licenses/old-licenses/gpl-2.0.html. You should be aware that the Materials might contain errors, omissions, inaccuracies, outdated information, and inadequacies and that the Materials may be subject to terms and conditions which may be found on a website or in the documents and policies of third parties. In the event of a conflict between the terms and conditions of these Terms and the terms and conditions which may be found on a website or in the documents and policies of third parties, the terms of these Terms shall control. We make no representations or warranties as to the completeness, accuracy, adequacy, currency or reliability of any Materials and shall not be liable for any lack of the foregoing. During the term of these Terms, T. E. A. L. grants you a limited, personal, non-exclusive, and non-transferable license to use and to display the Materials and use the Services and the Site solely for your personal use if you are an individual and solely for your business use if you are an organization or agent of your organization. You acknowledge and agree that you have no right to modify, edit, copy, reproduce, create derivative works of, reverse engineer, alter, enhance or in any way exploit any of the Materials in any manner. This limited license terminates automatically, without notice to you, if you breach any of these Terms. Upon termination of this limited license, you agree to immediately destroy any downloaded or printed Materials. Except as stated herein, you acknowledge that you have no right, title or interest in or to the Site or any Materials on any legal basis. You are responsible for use of the Site, even if the inappropriate activity was committed by a friend, family member, guest, intern, volunteer, or employee using your computer. Therefore, you must take steps to ensure that others do not gain access to your computer. In addition, you may not breach security or attempt to gain unauthorized access to another network or server. You must adopt adequate security measures to prevent or minimize unauthorized use of the Site by those using your computer. You may not attempt to circumvent user authentication or security. This includes, but is not limited to, attempting to access data not intended for you, logging into or making use of a server or account you are not expressly authorized to access, or probing or disrupting the security of other networks. Use or distribution of tools designed for compromising security is prohibited. Examples of these tools include, but are not limited to, password guessing programs, cracking tools or network probing tools. Users who violate systems or network security may incur criminal or civil liability. We shall cooperate fully with investigations of violations of systems or network security at other sites, including cooperating with law enforcement authorities in the investigation of suspected criminal violations. You will need a password to login to the Site and use certain functions and areas within the Site (“Restricted Areas”). If you are an authorized member of the Restricted Areas, you are responsible for maintaining the confidentiality of your password and account, and agree to notify T. E. A. L. if your password is lost, stolen, or disclosed to an unauthorized third party, or otherwise may have been compromised. You are responsible for activities that occur under your account. You agree to immediately notify T. E. A. L. of any unauthorized use of your account or any other breach of security in relation to the Site known to you. You will not use other members’ contact information gathered from Restricted Areas of the Site for commercial purposes and agree not to provide any other member’s contact information to any third party that is not a registered member of T. E. A. L.
For details on purchasing products and services on our Site please click www.tealwalk.org and www.telleveryamazinglady.org. You acknowledge and agree that T. E. A. L. reserves the right to institute charges for certain Services and to change T. E. A. L.’s fees and/or fee structures from time to time in T. E. A. L.’s sole discretion, and T. E. A. L. shall post notice of such changes on the Site. You agree that your continued use of all or part of the Site will be subject to your agreement to pay any applicable fees. You hereby acknowledge and agree that T. E. A. L. may use a third party service provider to process payments and/or donations, and that T. E. A. L. may share some of your information with such third party service provider in relation to such payments and/or donations. By using all or part of this Site, you consent to receiving electronic communications from T. E. A. L. and T. E. A. L.’s partners and affiliates. These electronic communications may include notices about applicable fees and charges, transactional information and other information concerning or related to our Site and Services. These electronic communications are part of your relationship with T. E. A. L. and you receive them as part of your use of the Site and/or our services. You agree that any notices, agreements, disclosures or other communications that we send you electronically will satisfy any legal communication requirements, including that such communications be in writing. Registration fees, donations, and shipping charges are non-refundable. Certain information and content may be provided by third party licensors and suppliers to T. E. A. L. (“Third Party Content”). The Third Party Content is, in each case, the copyrighted work of the third party creator/licensor. Unless you have permission from the owner of the Third Party Content, you agree to only display the Third Party Content on your personal computer solely for your personal or business use. You acknowledge and agree that you have no right to download, cache, reproduce, modify, display (except as set forth in this paragraph), edit, alter or enhance any of the Third Party Content in any manner unless you have permission from the owner of the Third Party Content. T. E. A. L. DISCLAIMS ALL EXPRESS, IMPLIED, AND STATUTORY WARRANTIES AND CONDITIONS WITH REGARD TO THIRD PARTY CONTENT, INCLUDING, BUT NOT LIMITED TO, ALL IMPLIED WARRANTIES OF MERCHANTABILITY, FITNESS FOR A PARTICULAR PURPOSE AND NON-INFRINGEMENT OF THIRD PARTY RIGHTS. This Site may be linked to other sites that are not T. E. A. L. sites. T. E. A. L. is providing these links to you only as a convenience, and T. E. A. L. is not responsible for the content or links displayed on such sites. Submissions – Notwithstanding the foregoing terms relating to your Posting(s), to the extent that you submit to T. E. A. L. any ideas, content, suggestions, information or feedback concerning the Materials and/or Services, including, but not limited to, content that you submit via e-mail or through a Posting (each, a “Submission”), such Submissions will be the sole and exclusive property of T. E. A. L.. You hereby assign, transfer and convey to T. E. A. L., T. E. A. L.’s successors, assigns, agents, and licensees, all worldwide right, title and interest in and to all intellectual property rights in the Submissions or any portion thereof, in any form of medium, expression or technology now known or hereafter known or developed, all contract and licensing rights, and all claims and causes of action with respect to any of the foregoing, whether now known or hereafter to become known. You represent, warrant, and covenant that (i) you are the sole owner of any intellectual property rights in the Submissions you provide to T. E. A. L.; (ii) you have the full and exclusive right to convey the entire interest in and to the Submissions; and (iii) to the best of your knowledge, the Submissions do not infringe any copyright, trade secret, patent or other intellectual property right. You covenant and agree to cooperate with T. E. A. L. to enable T. E. A. L. to obtain, sustain, enforce and enjoy to the fullest extent all right, title and interest herein conveyed. Impersonate or represent T. E. A. L., our staff or other industry professionals. Harvest user names, addresses, or email addresses for any purpose other than to conduct T. E. A. L. business. This list of prohibitions provides examples and is not complete or exclusive. T. E. A. L. reserves the right to (a) terminate your access to your account, your ability to post to this Site (or the Services) and (b) refuse, delete or remove any Postings; with or without cause and with or without notice, for any reason or no reason, or for any action that T. E. A. L. determines is inappropriate or disruptive to this Site or to any other user of this Site and/or Services. T. E. A. L. may report to law enforcement authorities any actions that may be illegal, and any reports T. E. A. L. receives of such conduct. When legally required or at T. E. A. L.’s discretion, T. E. A. L. will cooperate with law enforcement agencies in any investigation of alleged illegal activity on this Site or on the Internet. These prohibitions do not require T. E. A. L. to monitor, police or remove any Postings or other information submitted by you or any other user. Postings, Submissions, and unauthorized use of any Materials or Third Party Content contained on this Site may violate certain laws and regulations. You shall indemnify and hold T. E. A. L. and T. E. A. L.’s officers, directors, employees, affiliates, agents, licensors, attorneys, and business partners harmless from and against any and all costs, damages, liabilities, and expenses (including attorneys’ fees) T. E. A. L. or any other indemnified party suffers in relation to, arising from, or for the purpose of avoiding, any claim or demand from a third party that your use of the Site or the use of the Site by any person using your user name and/or password violates any applicable law or regulation, or the rights of any third party. Take any action that imposes an unreasonably or disproportionately large load on the Site’s infrastructure, including but not limited to “spam” or other such unsolicited mass e-mailing techniques. Disclose or share your IDs, assigned confirmation numbers and/or passwords with any unauthorized third parties or use your IDs, assigned confirmation numbers and/or passwords for any unauthorized purpose. Attempt to decipher, decompile, disassemble or reverse engineer any of the software or HTML code comprising or in any way making up a part of this Site. Upload, post, email or otherwise transmit any information, Posting, or proprietary rights that you do not have a right to transmit under any law or under contractual or trust relationships. Violate any applicable local, state, national or international law, including, but not limited to, any regulations having the force of law. Upload, post, email or otherwise transmit any information or Posting that is defamatory, fraudulent, indecent, obscene, or deceptive. Upload, post, email or otherwise transmit any information or Posting intended to threaten, harass, abuse or intimidate others. Damage our name or our reputation, or the name or reputation of our affiliates. Conduct screen scraping activities including, but not limited to unauthorized access, scraping, and downloading of data using any computer program or other method. Use any robot, spider, webbots, intelligent agent, other automatic device, or manual process to search, monitor or copy our Web pages, Materials, or Postings without our prior written permission, provided that generally available third-party Web browsers such as Microsoft Internet Explorer® may be used without such permission. T. E. A. L. is a trademark of T. E. A. L. in the United States. All other trademarks, names and logos on this Site are the property of their respective owners. Unless otherwise specified, all information and screens appearing on this Site, including documents, site design, text, graphics, logos, images and icons, as well as the selection and arrangement thereof, are the sole property of T. E. A. L., Copyright © 2007-2012 T. E. A. L.. All rights not expressly granted herein are reserved. Except as otherwise required by applicable law, any reproduction, distribution, modification, retransmission, or publication of any copyrighted material is strictly prohibited without the express written consent of the copyright owner. Identification of the material that is claimed to be infringing or to be the subject of infringing activity and that is to be removed or access to which is to be disabled at the Site, and information reasonably sufficient to permit T. E. A. L. to locate the material. Information reasonably sufficient to permit T. E. A. L. to contact you as the complaining party, such as an address, telephone number, and, if available, an electronic mail address at which you may be contacted. T. E. A. L.’s agent for notice of claims of copyright or trademark infringement on this Site can be reached by email at info@tealwalk.org. If we receive a notice that complies with the DMCA, we will remove or disable access to any material claimed to be infringing or claimed to be the subject of infringing activity. We will take reasonable steps to notify the user that created or posted the relevant material that it has been removed or access to it has been disabled. We may elect not to respond to DMCA notices that do not comply with all of the foregoing requirements, and we may elect to remove allegedly infringing material that comes to our attention via notices that do not comply with the DMCA. You will use the Site for your personal use or your business use of our services and not for any commercial purpose. Your use of this Site and any Services is at your own risk. Neither the Materials, Postings nor the Third Party Content have been verified or authenticated in whole or in part by T. E. A. L., and they may include inaccuracies or typographical errors. T. E. A. L. does not warrant the accuracy of timeliness of the Materials, Postings or the Third Party Content contained on this Site. T. E. A. L. has no liability for any errors or omissions in the Materials, Postings and/or the Third Party Content, whether provided by T. E. A. L. or our licensors. T. E. A. L., FOR ITSELF AND ITS LICENSORS, MAKES NO EXPRESS, IMPLIED OR STATUTORY REPRESENTATIONS, WARRANTIES, OR GUARANTEES IN CONNECTION WITH THE SITE, SERVICES OR ANY MATERIALS, POSTINGS OR THIRD PARTY CONTENT OR RELATING TO THE QUALITY, SUITABILITY, TRUTH, ACCURACY OR COMPLETENESS OF ANY INFORMATION OR MATERIAL CONTAINED ON THE SITE, INCLUDING, WITHOUT LIMITATION, THE MATERIALS, POSTINGS AND THE THIRD PARTY CONTENT. TO THE MAXIMUM EXTENT PERMITTED BY APPLICABLE LAW, THE SITE, SERVICES, MATERIALS, POSTINGS, THIRD PARTY CONTENT AND ANY INFORMATION OR MATERIAL CONTAINED ON THE SITE IS PROVIDED TO YOU ON AN “AS IS,” “AS AVAILABLE” AND “WHERE-IS” BASIS WITH NO WARRANTY OF ANY KIND, WHETHER EXPRESS, IMPLIED OR STATUTORY, INCLUDING, WITHOUT LIMITATION, THE IMPLIED WARRANTIES OF MERCHANTABILITY, FITNESS FOR A PARTICULAR PURPOSE AND NON-INFRINGEMENT OF THIRD PARTY RIGHTS. T. E. A. L. DOES NOT PROVIDE ANY WARRANTIES AGAINST VIRUSES, SPYWARE OR MALWARE THAT MAY BE INSTALLED ON YOUR COMPUTER. T. E. A. L. SHALL NOT BE LIABLE TO YOU OR ANY THIRD PARTY FOR ANY DAMAGES RESULTING FROM YOUR DISPLAYING, COPYING, OR DOWNLOADING ANY MATERIAL, POSTINGS OR THIRD PARTY CONTENT ON THE SITE OR YOUR USE OR INABILITY TO USE THE SITE OR SERVICES. IN NO EVENT SHALL T. E. A. L. BE LIABLE TO YOU OR ANY THIRD PARTY FOR ANY INDIRECT, EXTRAORDINARY, EXEMPLARY, PUNITIVE, SPECIAL, INCIDENTAL, OR CONSEQUENTIAL DAMAGES (INCLUDING LOSS OF DATA, REVENUE, PROFITS, USE OR OTHER ECONOMIC ADVANTAGE) HOWEVER ARISING, EVEN IF T. E. A. L. KNOWS THERE IS A POSSIBILITY OF SUCH DAMAGE. The limitation of liability reflects the allocation of risk between the parties. The limitations specified in this Section will survive and apply even if any limited remedy specified in these Terms is found to have failed of its essential purpose. The limitations of liability provided in these Terms inure to the benefit of us and our affiliated or related entities, and to all respective officers, directors, employees, representatives, attorneys, and agents. IN NO EVENT SHALL T. E. A. L.’S AGGREGATE LIABILITY FOR DIRECT DAMAGES ARISING OUT OF OR RELATED TO THIS AGREEMENT EXCEED FIVE HUNDRED DOLLARS (USD $500). You may use the Site to create an online fundraising page, create an event or virtually attend someone else’s event. By doing so you hereby for yourself, your heirs and your personal representatives assume any and all risks that might be associated with the event. You further waive, discharge, release, and covenant not to sue T.E.A.L., its officers, directors, organizers, employees, sponsors, volunteers, and individuals having any connection to the event, or other representatives or agents or their successors and assigns, or the owner of the site for the event, or their respective officers, directors, employees, or other representatives or agents or their successors and assigns, for any and all injuries, accidents, property losses, hazardous health conditions, or damages of any kind from present and future claims and liabilities of any kind, known or unknown, arising out of my participation in this event or related activities, even though such claim or liability may arise out of negligence or fault on the part of any of the foregoing persons or entities. You grant permission to the foregoing persons and entities to use or authorize others to use any photographs, motion pictures, recordings, name and quotations, or any other record of your event or related activities for any legitimate purpose. Permission is perpetual and worldwide. T. E. A. L. controls and operates this Site from T. E. A. L.’s headquarters in the United States of America and the Materials may not be appropriate or available for use in other locations. If you use this Site outside the United States of America, you are responsible for following applicable local laws. T. E. A. L. prefers to advise you of your inappropriate behavior and recommend any necessary corrective action. However, certain violations of these Terms, as determined by T. E. A. L. in T. E. A. L.’s sole discretion, will result in termination of your access to the Site or Restricted Areas. T. E. A. L. has the right to terminate any password-restricted account for any reason. T. E. A. L. will provide you with notice of the termination of your account. New York law and controlling U.S. federal law, without regard to the choice or conflicts of law provisions, will govern these Terms. Any disputes relating to these Terms or the Site will be heard in the state and federal courts located in the Commonwealth of New York. If any of these Terms is found to be inconsistent with applicable to law, then such term shall be interpreted to reflect the intentions of the parties, and no other terms will be modified. T. E. A. L.’s failure to enforce any of these Terms is not a waiver of such term. The Terms are the entire agreement between you and T. E. A. L. and supersede all prior or contemporaneous negotiations, discussions or agreements, written or oral, between you and T. E. A. L. about the Site. The proprietary rights, disclaimer of warranties, indemnities, limitations of liability and general provisions shall survive any termination of these Terms.